Jeff's Baking Blog – Page 8 – Cooking is like love. 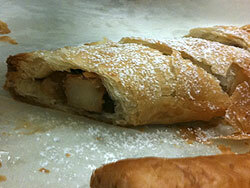 This week in baking class we covered Pies and Strudel. A pie is usually made of a pastry crust that holds a filling. 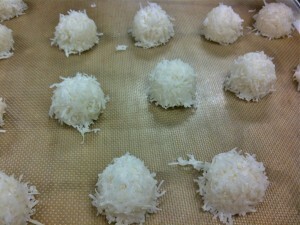 The filling can be made with many different ingredients, from sweet to savory, from fruit to meat, cheese or even fish. The filling is placed on top of a bottom crust. An additional crust can cover the top of the pie, as a solid piece or a cutout design with openings. A strudel is a layered pastry, like phyllo dough, with a sweet filling. Often they are served with confectioners sugar and cream. 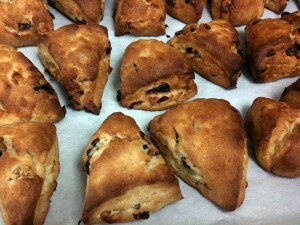 Prepared by folding the edges of the dough over the top of the filling on a flat surface (not in a pie pan). Single Crust – crust is only on the bottom of the pan. Double Crust – a solid crust both on the bottom and top of the pie. 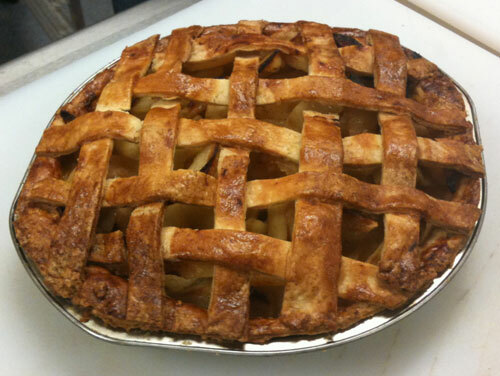 Lattice – a solid crust on the bottom of the pie and a weaved or intricate design with openings on as the top crust. Crushed Graham Cracker or cookies make up the crust. The fat(s) should be cut into the flour using either your hands, a pastry cutter or a food processor until pea-sized pieces of fat remain. The fat(s) must cold to retain shape and release moisture to create the flakiness in the crust during the baking process. 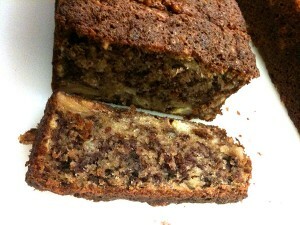 The recipe we used in class used two fats, butter for flavor and shortening for texture (flakiness). The water in the butter creates the steam that creates the flakiness by creating air pockets in the dough. 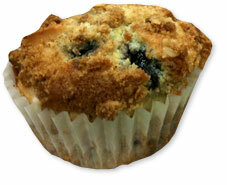 There are many different recipes that use different fats and combinations of fats. Don’t overwork your dough or it will come out tough. Usually the liquid is water. This should be ice cold in order to keep your fats from warming to room temperature. Be careful not to get ice into your dough, it will create too much moisture. The flour absorbs the liquid over time so do not add too much liquid – even if the dough seems a little dry. The dough needs to rest under refrigeration for around 45 minutes to an hour in a flat disc shape and then rolled out. The resting enables the liquids to be absorbed by the flour and begin the gluten formation of the dough. Pies require the dough to be cooked in different manners. Some require raw dough with small poked holes on the bottom crust. This prevents the dough from bubbling up when it’s cooked. The holes are not necessary for pies who’s fillings are heavy enough to hold the dough down as its being baked. Other pies require the crust is partially baked or fully baked. This is usually done in order to keep the bottom crust from becoming soggy or undercooked from a moist filling. Juicy filling will need to have a thickening agent (cornstarch, flour, tapioca) added before cooking so that the bottom crust will cook and not be soggy. When doing para (partial) baked crust or fully baked crust a method called Blind Baking is sometimes used. With blind baking, rather than punching holes in the bottom crust before baking the crust is filled with weights (beans, rice or even small metal balls) that fills the pie pan and holds down the dough. Its called blind baking because you can not see the baking process of the crust. The weights are removed at 1/2 through the baking time (for both para and fully baked). When a top crust or lattice is used several different techniques need to be used. 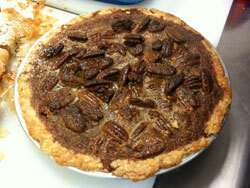 For a top crust, the pie must have slats or holes cut in it to allow steam to leave the pie as it bakes. When doing a lattice, which is a common way of baking apple pies, or top crust, the filling should be cooked or partially cooked in order to shrink the filling to the same volume as its finished product. This is so the lattice or top crust does not dome and create an air pocket that crumbles when the pie is cut. Its a good idea to cook your pie on a baking sheet so that any spillage during the baking process does not drip into the oven. A glass pie pan enables one to see if the crust is done on the bottom – however, a metal pan will brown the crust, a glass one will not brown the crust. Living with someone with gluten intolerance usually throws a curveball when it comes to holiday baking. 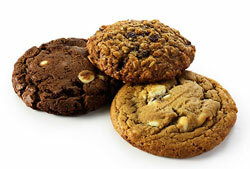 Valentine’s Day is one holiday was gluten intolerance actually helps in selecting the perfect melt-in-your-mouth gift. No flour needed, who can resist chocolate, whip cream, and sugar? Rub cold butter on the inside surface of the 10 inches (25 cm) cake pan and place a parchment paper liner on the bottom. Preparing a pan so that you can easily remove the cake after it is baked can be done in many ways. I like to keep the paper insert that comes in the pan when you purchase it. I glue that to a thick piece of cardboard and cut it out to use as a template for cutting parchment paper. I keep the template in the pan when its stored so I have easy access to it as well as a nice place to make notes about the pan. In a saucepan over medium heat combine the water and 6 ounces of the sugar and bring to a boil. Remove the pan from the heat and stir in the chocolate until melted and combined. Add the butter and stir until its melted and incorporated completely. Set the pan away from the stove to cool the chocolate mixture. In a mixer with the whisk attachment whip the eggs and 3 ounces of sugar at high speed until light and fluffy (about 3 minutes). Be careful not to over whip or the mixture will be hard to work with and make your finished cake fall apart. Gently fold the chocolate (it can be warm but not hot) into the whipped eggs and sugar. Pour the batter into the prepared cake pan. Place the cake pan on a baking sheet with a raised edge that is deep enough to hold an inch of water. Place the pan on the oven rack in the middle of the oven and pour the water onto the sheet to create a water bath. Carefully push the rack back into the oven and bake for 40 minutes or until the top of the cake is firm to the touch. Refrigerate the cooled cake for 120 minutes or overnight so that the chocolate sets so the cake can be cut. Once the cake has set gently move the cake pan over a burner on the oven for a few seconds to loosen the cake edges from the pan. Slide a paring knife around the outside of the pan. Invert the cake on the dish you plan on presenting the cake on (the cake cannot be moved to another plate once it’s been removed). Pull up on the sides of the pan, your cake should slide out. If not use the burner to warm it some more and try again. Peel the parchment paper off the top of the cake. With a stand mixer and the whisk attachment whip the cream with 1 tablespoon of sugar until just under stiff peaks. Put about a third of the whipped cream in a pastry bag with a tip of your choice (the larger the tops opening the better). Find the center of the cake by marking it into fourths with a knife. Starting at the center point pipe the whipped cream in a circle with each circle touching the last one. Add more whipped cream to the pastry bag as needed until the whole top surface of the cake is covered. 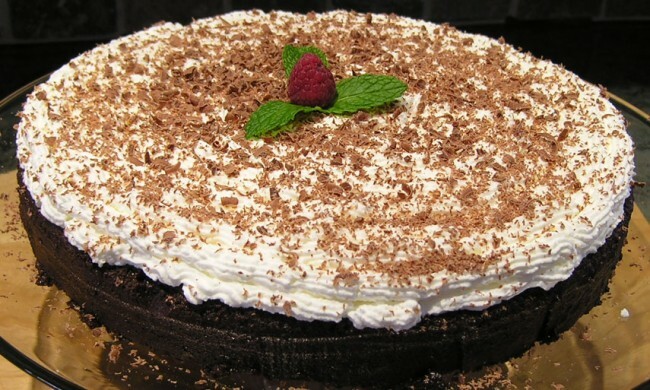 Sprinkle chocolate shavings on the top of the whipped cream. Butter and line one 10 inches (25 cm) cake pan. Break the chocolate into small pieces and cut the butter into pieces (about 1 inch by 1-inch squares). Put the water and 6 ounces (170 g) sugar in a saucepan and bring to a boil. Remove the pan from the heat. Add the chocolate pieces and stir until the chocolate is melted and incorporated. Add the butter, in chunks, and stir until melted. Set aside to cool. Whip the eggs with the 3 ounces (85 g) sugar at high speed for about 3 minutes. The mixer should be light and fluffy. Do not over whip to stiff peaks. Fold the cooled to room temperature melted chocolate into the egg mixture. Put the batter in the prepared pan. Place the pan in a water bath. Bake at 350°F (175°C) for 40 minutes or until the top is firm. Refrigerate the cake until the chocolate is set (at least 2 hours – overnight is best). Remove the cake from the pan by warming the outside of the pan on a burner, and invert the cake pan onto a final serving platter. Peel the circle of baking paper off the top of the cake. Whip the cream with 1 tablespoons (15 g) sugar until just under stiff peaks. Place the whipped cream in a pastry bag with a large tip of your choice. Starting at the center of the cake pipe the whipped cream in a circle with each circle touching the last one, covering the top of the cake. Sprinkle chocolate shavings over the top and garnish as you wish. Important note: this is a very delicate cake – cut the cake using a thin knife dipped in hot water, after every single cut clean the knife off and run under warm water again (the cake is sticky and tender and will fall apart if sliced at room temperature or with a knife that’s not cleaned between each slice). Next time you see berries on sale, here is a great way to use them. I’ve used raspberries here, but it would work with any type of juicy berry. Its great on ice cream or even on the side of any dessert. Start out by pureeing the raspberries. I used a large cup and an immersion blender. These blenders are very easy to clean and just as effective as a traditional stand blender. Five or six fast pulses and you’re left with a nice thick seedy mixture. Now comes the fun part – removing the seeds. 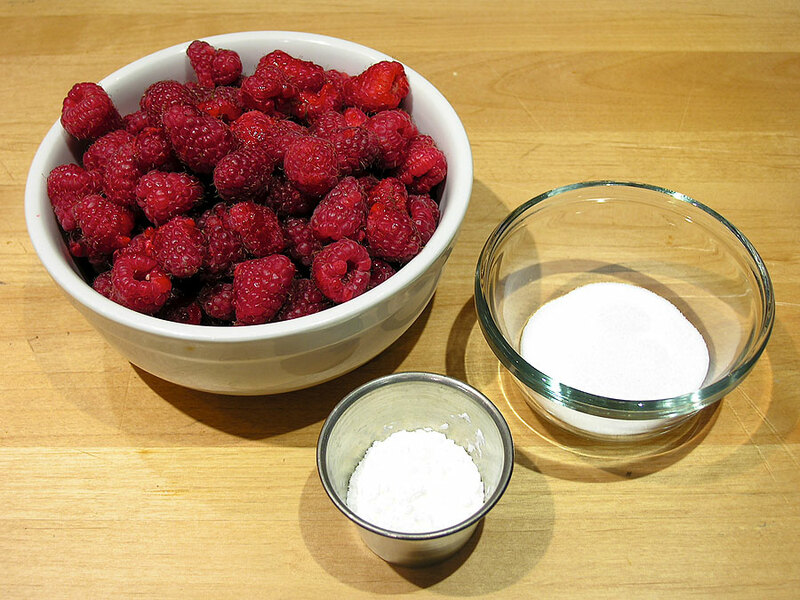 Over a bowl place a strainer and pour about 1/2 a cup of the pureed raspberries into the strainer. Using a large rubber scraper and some patients move the mixture back and forth to push the juice through the mesh. Eventually, your left with just seeds. Toss the seeds out and repeat until you have strained all the raspberry puree. When done you should have 2 cups (480 ml) of juice. If it is not that much you can add water to the make up the difference (I added about 1/4 a cup of water to mine). On the stove place your cornstarch in a saucepan. Add about 1/3 a cup of the seedless puree to the cornstarch and stir until completely incorporated with no clumps. Now add the rest of the puree to the saucepan and stir until combined. With the heat on medium bring the mixture to just about boiling (simmering). Add the sugar, taste the sauce and if you need it to be sweeter add more sugar, simmer for one more minute. Remove the pan from the burner and allow the sauce to cool. If the sauce is too thick add a little water. 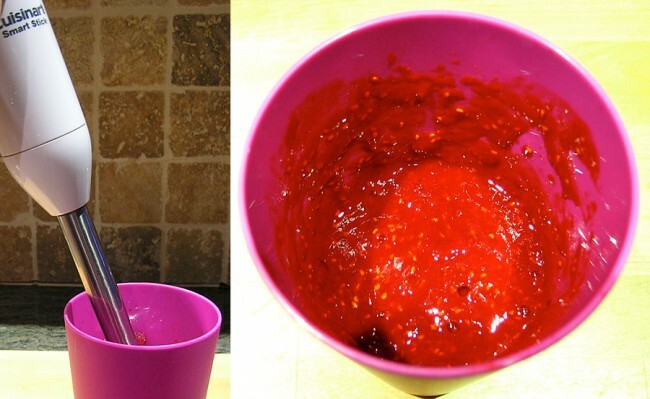 Place the sauce in a condiment bottle or covered container and refrigerate. Use as needed. Puree the raspberries. Strain out the seeds. Combine a little raspberry juice and the cornstarch in a sauce pan until combined. Add the rest of the raspberry juice. Heat until simmering. Add the granulated sugar and simmer the sauce for 1 minute. This week in baking class we covered quick breads. 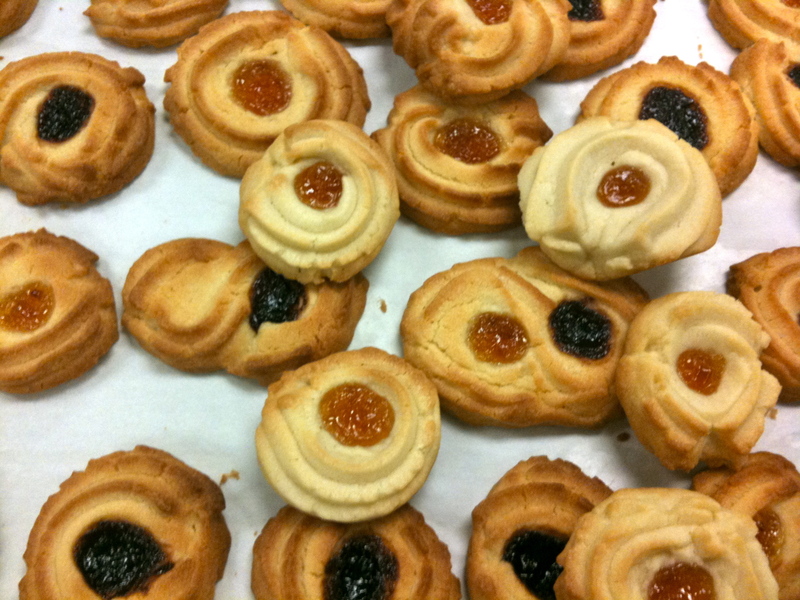 These baked goods use chemical leavening rather than yeast. Through the use of baking soda and or baking powder the baked item raises. Baking Soda is pure sodium bicarbonate. When it interacts with moisture and the acid in the batter it produces bubbles of carbon dioxide that get larger with heat, causing quick bread to rise. Baking powder includes sodium bicarbonate and acid. It’s available as single-acting or double-acting. Single-acting is activated by moisture – meaning you must bake it once you have mixed the batter. Double-acting reacts in two phases, some gas is released at room temperature when the powder is added to the mixture, however, the majority of the gas is released in the oven (heat) – so you don’t have to bake it right after mixing the dough. If you use too much baking soda the result will be a soapy bitter taste. We made four quick breads (banana bread, biscuits, muffins, and scones) and learned about three different blending methods. 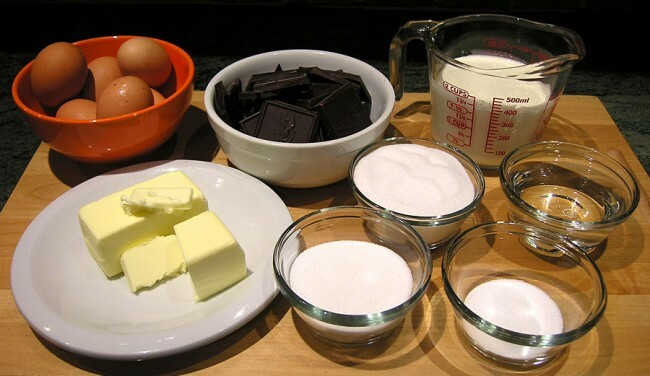 Step 1: Mix fat and sugar in the mixer with a paddle until light in color, creamy and soft. Step 1: Combine all dry ingredients. Step 2: Combine all the wet ingredients. Step 3: Gradually add the dry ingredients to the wet ingredients. Step 2: Cut in the fat using your hands or a hand held tools (like a pastry cutter or two knives). Step 3: Add liquid mixing by hand. Step 3: Pat down or roll out and cut. Our friends Terry and Karen invited us up for a Superbowl get together. I was leaning towards my dark chocolate cream filled cupcakes, but decided to try a Red Velvet Cupcake instead. 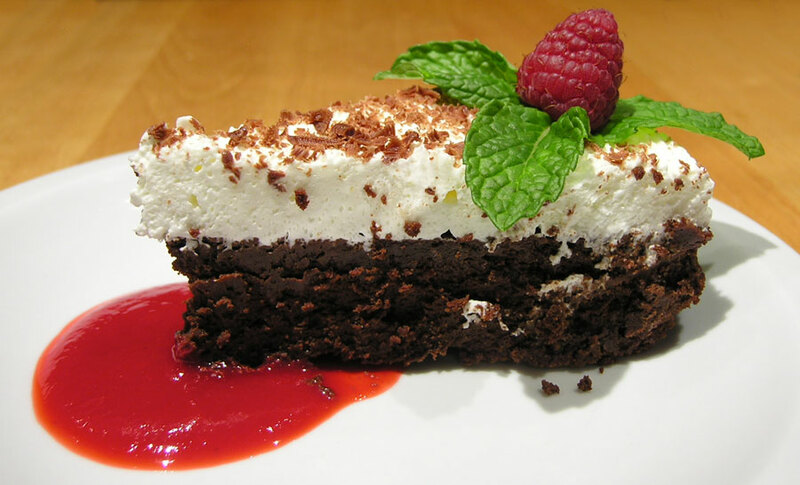 Red Velvet cake is usually a layered cake, with its flavor somewhere between chocolate and vanilla. 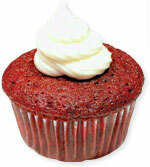 Its color is usually bright red to dark red and it is traditionally topped with creamy frosting. The red color is from food coloring, but has its roots in non-Dutch Pressed cocoa and sometimes beets that were used to enhance its color and moisture before alkaline Dutch Process cocoa was widely available (non-alkaline cocoa is redder in color). Having not made Red Velvet cake before I turned to one of my favorite blogs, Smitten Kitchen for a recipe. If you’re looking for an addicting blog look no further. 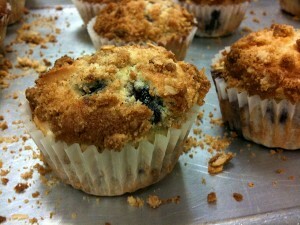 The site has great photography, writing, and recipes. I’m using the cake recipe but adapting it for cupcakes. 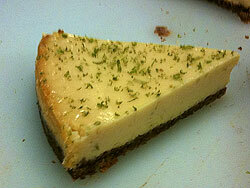 I’m using my own recipe for Cream Cheese Frosting – its fairly basic and I’m sure very common, but its reliable. Whisk cake flour, cocoa, and salt in a bowl until well combined. In an electric mixer combine oil and sugar and beat at medium speed until well-blended. It starts to look almost like butter and sugar when it’s combined. Beat in the eggs one at a time until well incorporated. With the machine on low, slowly add the food coloring and then the vanilla. The recipe calls for 6 tablespoons of food coloring – I only had 4 so I added 2 tablespoons of water. The color turned out great regardless. Add flour mixture alternately with buttermilk (flour, buttermilk, flour). Scrape down the bowl and beat just long enough to combine. If you cant find buttermilk in the store you can make your own substitute by combing just under a cup of milk and 1 tablespoon white vinegar or lemon juice and let it rest for at least 5 minutes. I used the real stuff for this recipe. Place baking soda in a small dish, stir in vinegar and add to batter. Beat for 10 seconds. Your batter will start to lightly bubble at this point. Fill the cupcake liners 3/4 of the way. I like to use a liquid measuring cup with a spout to pure the batter into the liners. I also use a rubber scraper to stop any drips on the side of the measuring cup. Line muffin tin with paper liners (30-35). In an electric mixer combine oil and sugar and beat at medium speed until well-blended. With machine on low, slowly add red food coloring and vanilla. Add flour mixture alternately with buttermilk (flour, buttermilk, flour). Scrape down bowl and beat just long enough to combine. Place baking soda in a small dish, stir in vinegar and add to batter. Beat for 10 seconds. Fill liners 3/4 of the way, bake 20 to 25 minutes. Mix in the sugar one cup at a time on the slowest speed. 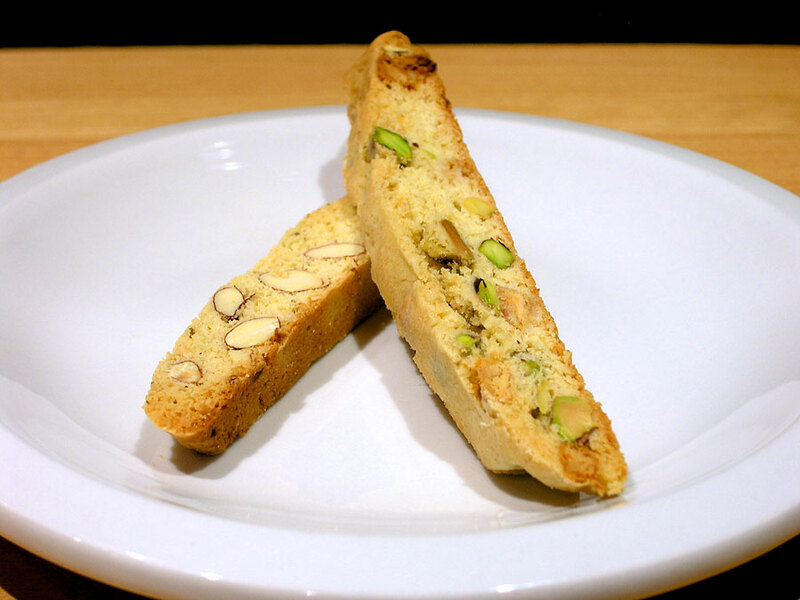 Biscotti are twice-baked cookies, also known as cantuccini. Often they containing nuts, dried fruits and or spices. 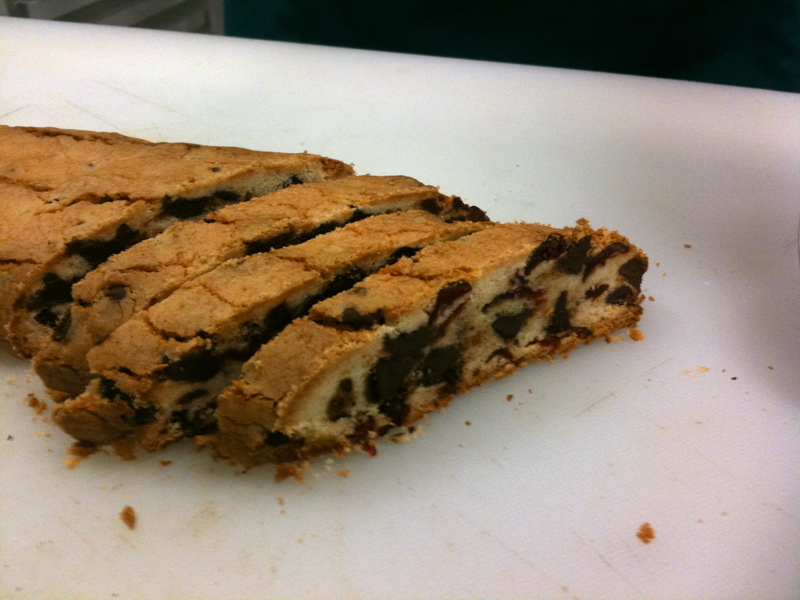 The hardness of Biscotti is determined by the amount of sugar and eggs in the dough, rather than the baking time. Biscotti are formed by baking the dough in long rolls that are flattened into a slab. Once baked the slabs are cut into slices and baked again until they are toasted and dry. After the second baking, biscotti may be dipped in glazes and topped with nuts etc. I’ve measured out all my ingredients and placed them in bowls. It’s a bit like a TV show – but I’m doing it in an effort to make sure I have all the ingredients for the recipe. It’s a habit I need to get into doing, I sometimes think I have something on hand and I don’t. So most my posts of things I’ve backed at home will probably begin with one of these shots. Using a mixer with the paddle attachment, blend the butter and sugar until well combined. Add the eggs one at a time. One egg at a time is important if you were to add all the eggs at once you would end up with a clumpy mess that could not be fixed without excessive beating of the mixture. This would change the texture of the batter when baked – something we don’t want to do here. Add the last of your wet ingredients, the vanilla. In a bowl place your flour, salt, and baking powder. I use a whisk to incorporate the ingredients evenly. Sifting would add air to the flours were using a whisk adds minimal air while mixing the ingredients evenly. Combining the dry ingredients here is so that you do not have to overwork the mixture when they are combined with the wet. With the mixer on slow add the dry ingredients slowly to the wet until just incorporated. 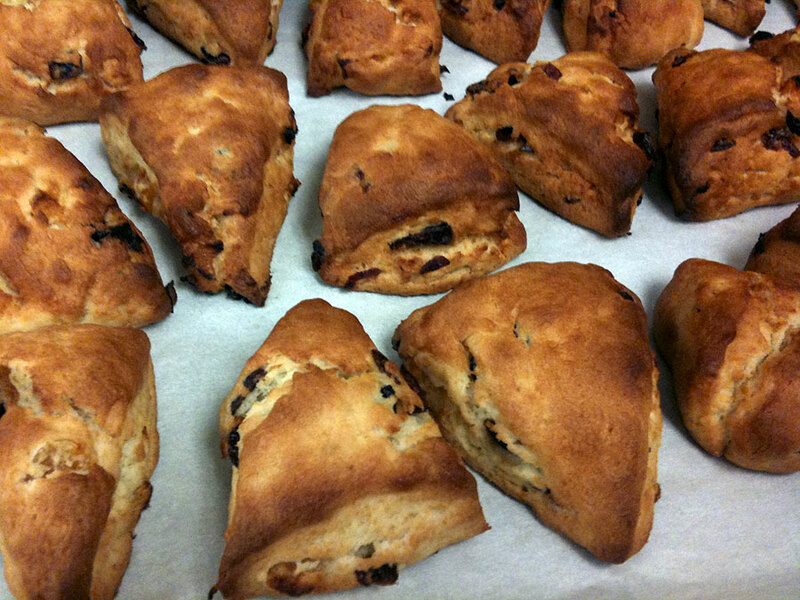 Divide the dough into two even amounts – placing one of them in a bowl and keeping the other half in the mixer. Then with the mixer set on low add your garnishes until just incorporated. 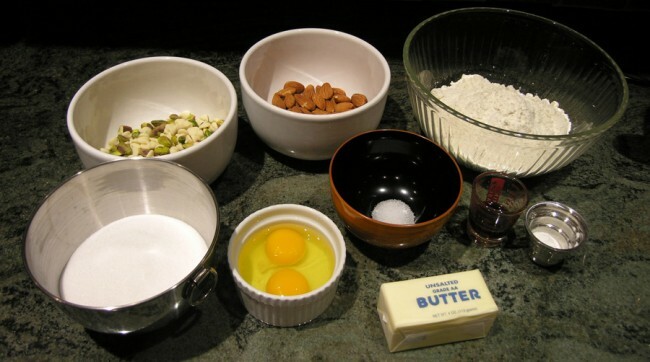 Place the just mixed batter in a bowl and mixed the plain batter with your other garnishes. In this case, I did the Pistachios and White Chocolate Chips first. I did this because the other type of garnishes I’m using are Almonds and Anise Seed – the seeds are small and I did not want to have to wash the mixing bowl before mixing the other batch. Using some flour on your hands, shape the dough into logs on a baking sheet covered with parchment paper. Then flatten the rolls into thick slabs (about 1 inch thick). 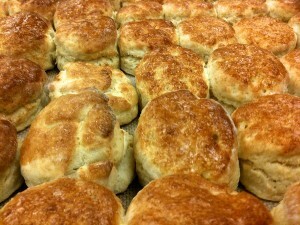 With your oven set to 350° bake until firm to touch and golden brown in appearance (20-30 minutes). Tip: If you find the dough is too sticky to form into rolls, put the dough in the fridge for 15 minutes to harden it a bit. Remove from the oven and allow to cool completely. Set the oven temperature to 320°. Slice the cooled biscotti logs into 1/2” thick slices. Place the slices on the same baking sheet on their sides and bake for 10-12 minutes. In a mixer fitted with a paddle, mix the butter and sugar until well blended. Add the eggs, one at a time, beating well after each addition. Add the vanilla. In a separate bowl mix together the flour, salt and baking powder and then add to the butter mixture slowly until just incorporated. Add in almonds and hazelnuts. With floured hands, shape the dough into skinny logs and place on a parchment lined baking sheet. Bake at 350° until golden and firm to touch, about 20-30 minutes. Let cool and slice into 1/2” thick slices, lay flat on same baking sheet and bake at 325° for 10-12 minutes. You can add whatever ingredients you want to make variations. Keep fruits small so they do not rip the Biscotti when cutting it before the final baking. Scoop is used to ensure consistent size, baking time, texture etc. Step 1: Creaming. Creaming is mixing fat and sugar in the mixer with a paddle (no air) until light in color, creamy and soft. Do not use higher than 2 on your mixer as it will effect the texture. Benefits: adjustable size, nice looking, use when needed. Use table salt for best absorption (Kosher Salt not as good in baking as in cooking). Sifting eliminates clumps, incorporates all ingredients evenly and introduces air into the flour (air is a leavening agent – changes gluten interaction.) Generally only sift if a recipe calls for it. San Diego is very diverse with a lot of different markets and food resources. 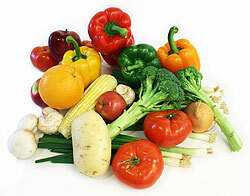 Below are some of the most reasonable markets for produce, spices and herbs. Its by no means a complete list. If you would like to add them to your address book you can download a vCard of them all plus a few others here. I recently began a class at the local Community College. Even if your not interested in Baking you really should check out the offerings of the College system. Many of the classes are free or have a nominal fee. Professional Bakeshop Skills Class covers information from baking theory and techniques to hands-on production techniques. Prepare doughs and bread, cakes and icings, cookies, custards, pastries, mousses, frozen and fruit desserts. Its an 18 week class – with one week off for spring break. This is the first 100 hours in a two-part baking program the school offers. Tomorrow is cookies and we will be making Almond Hazelnut Biscotti, Coconut Macaroons, Oatmeal Coconut Jam Bars, Spritz Rings and Vanilla Roll-Out Cookies. January 28: Orientation: rules, regulations, safety sanitation, equipment ID, ingredient ID and palate development. 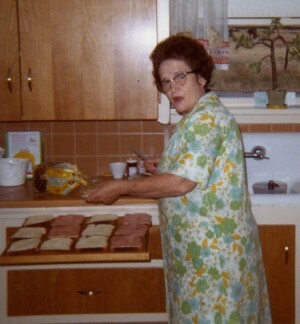 My Grandma Lois was a great cook and baker. Every summer on our annual week-long visit she would feed us so much food we wouldn’t need to eat for months. Homemade bread with every meal. Almost everything was made from scratch. She seemed to be in the kitchen all day long. 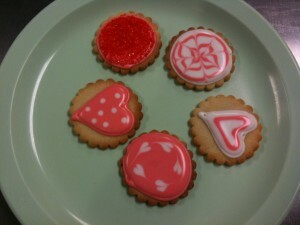 In an effort to become a better baker myself I have enrolled in an 18 week Bake Shop Skills class. I plan on posting pictures, recipes and techniques I learn in the class here. Class started on the 18th of January. One of the things we learned in the first class was gluten content of wheat-based flours. I knew that the different varieties of flour had different gluten content, but had no idea how much or what difference it made. Gluten is a protein that forms when liquid is added to the flour and the mixture is agitated. The more agitation the more gluten that is produced (flours with higher gluten content will produce more gluten when agitated as well). I’m sure there will be much more on this subject as it affects texture and density of bread. Its no wonder some things I have baked have turned out with odd textures and consistencies – I have left things in the Kitchen Aid mixing for way too long, while I watched TV or talked with my partner. Good luck finding Pastry flour or reasonably priced cake flour in your regular super market – most only have AP and Bread flours.